I’m going to deviate a bit from talking about home improvements…. I like pizza, I like cooking, therefore I decided I should try making pizza. Specifically, I wanted to make a neapolitan style pizza like Tutta Bella. Neapolitan pizzas have strict rules about how they can be made. In particular, I like the crust on these pizzas. They’re thin, gooey and delicious. Making the crust on a Neapolitan pizza requires the use of only a handful of ingredients: Flour, Salt, Water and Yeast. My favorite crust recipe is the Modernist Cuisine variant. The hard part is that they need to be cooked in a wood fire oven. This is not a post on how to build your own wood fire oven. I’m determined, but not that determined! Wood fire ovens get hot, really hot, 700+ degrees. In a wood fired oven, the pizza cooks in less than three minutes. Like I said, I didn’t build a wood fire oven, so I had to find another option. Home ovens don’t get anywhere near hot enough. To mimic the behavior of a wood fire oven you need to use something that can create even heat and quickly transfer the heat to the pizza. 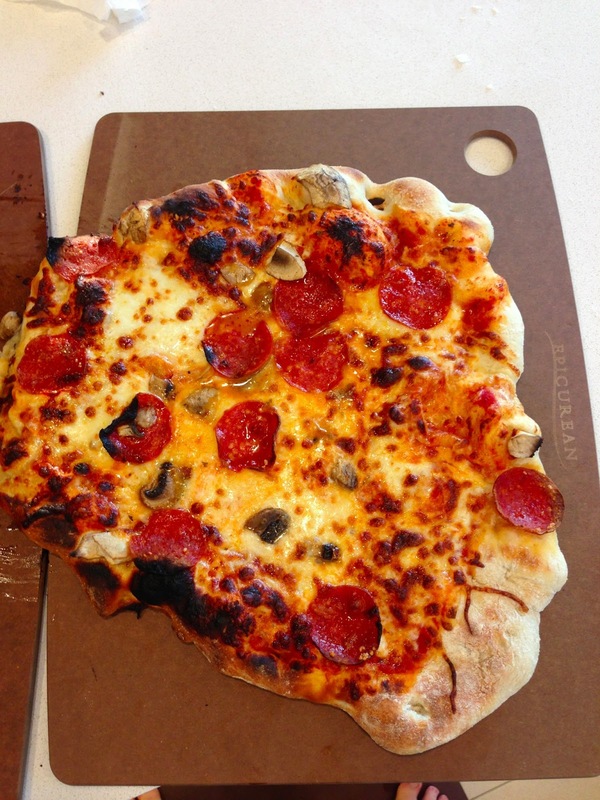 Normally, people use a pizza stone to do this at home. While looking into baking stones I ran across the Modernist Cuisine pizza steel. Modernist Cuisine does a lot of cool stuff, if I had a larger kitchen pantry and a bigger budget, I’d have all of the gadgets they recommend. I think playing with an antigrill would be fun. The folks at Modernist Cuisine recommend using a pizza steel over a stone because it works better. If making your own seems like too much work, go to Amazon and buy one from them. They sell theirs for $99, and it has their name engraved on it. It’s pretty and made in the USA. $99 seemed steep to me for something I’m not going to use all that often, I made my own for $49 ($45 in steel and $4 in supplies). Since this blog post first launched, a lot of other people have started making baking steels. There are lots of options on Amazon. I think it’s going to be hard to beat the price to effort ratio of this one for example. 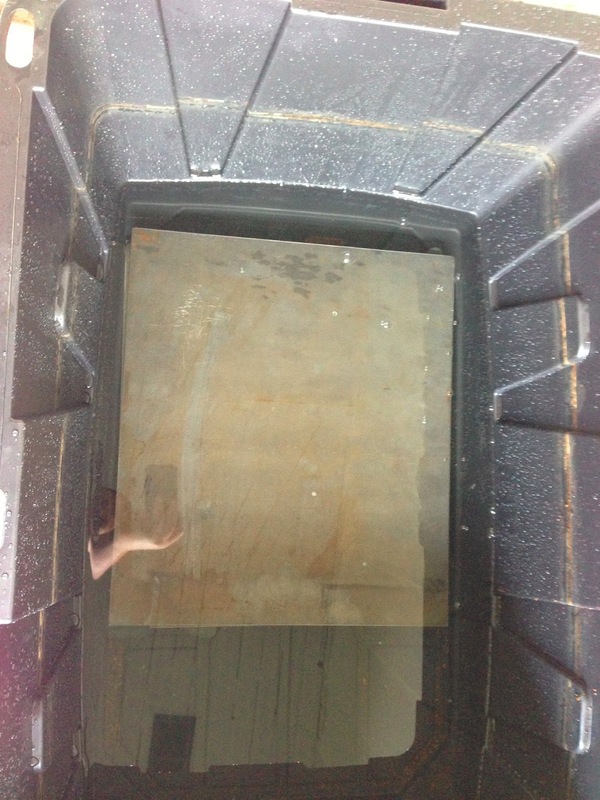 I bought a 14″x16″x3/8″ steel plate from Eddie at Exor Ironworks. Eddie ground the edges so that they’d be smooth. He sold me the steel plate for $45. If you don’t live in Seattle, find a local blacksmith and ask for an “A36 Steel Plate”. A36 is the alloy. Keep in mind that Steel has a weight of .284 pounds per cubic inch. That means that my baking steel is nearly 24 lbs! The steel plate from your local blacksmith will be coated in a rust like material called “mill scale”. Before you use the steel, you need to get the mill scale off. The easiest way to do that is with white vinegar. I used an old storage container I had and submersed my plate for 48 hours in the bucket. If you don’t have a bucket handy, a garbage bag will work just fine too. Without the mill scale to protect it, the plate will start to rust. Stick the plate in the oven at a high temperature to dry it quickly. Once the baking steel is thoroughly dry, you need to season it like you would with a cast iron or carbon steel pan. If you want to learn more about seasoning cast iron, Sheryl Canter has the best post I’ve read. I followed her instructions, use flax seed oil and apply three coats. The seasoning will keep the pan from rusting. Congratulations! You now have a ready to use baking steel! The key is to give the steel plenty of time to heat up. I put my steel in the upper third of my oven then let the oven heat up at maximum temperature for 45 minutes. I then run my broiler for 15 minutes, leading to an hour of preheat time. Using this method, I’ve gotten my steel to 700 degrees. To get the pizza on and off of the steel, you’re going to want a pizza peel. I very much have to work on my dough stretching skills but here are a pair of pictures from recent attempts. I over cooked the pizza in the picture, but it was still delicious. Love how the crust came out! Soak plate in vinegar for 48 hours.